We are happy to adapt our workshops to suit the needs of your business or team. Our workshops are flexible in terms of timing and content. We can accommodate small teams of 4 people up to larger teams of 40-50 people. Please call us to discuss how we can work around your schedule and help you to create a memorable, informative and empowering day. Bring your team to HoofbeatZ for a unique and unforgettable experience. 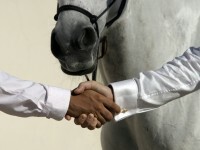 Our equestrian-themed team-building exercises are designed to help you and your colleagues to develop trust and respect and to encourage stronger relationships, better communication and greater efficiency in the work place. During the course of the workshop you will learn how to interact safely with horses, how horses develop bonds of trust, how to connect with them and you will also have fun with plenty of hands-on interactive equestrian activities. Our horses are specially-trained, gentle and playful and can teach us a thing or two about our own behaviour towards others. No equestrian experience is necessary. Fun, insightful and empowering, these workshops are a guaranteed to bring your team closer together. Price based on course. Range from AED 400 to AED 2,000 per participant. Duration: 2 hours min to max 5 hour full day workshop.